The Pros and Cons of "Extreme Couponing"
You’ve probably heard of the TLC show Extreme Couponing. But if not, all you need to know is that it’s about people and families who can cut their large grocery bill by 50% or more by using coupons. That sounds like a great way to save on food for your family, but these extreme couponers take it to a whole new level. The people featured on Extreme Couponing spend hours each week sifting through papers and ads looking for great savings and free offers. Sometimes they even go dumpster diving to get more coupon inserts. They then strategically find ways to pair coupons together or combine them with sales to ensure they receive as low a price for items as they can. Now, I’ll be the first person to admit that saving money always sounds like a great idea. However, when it comes to couponing, the question “is it really worth it?” begs to be asked. Is it worth your time and effort to dedicate several hours each week to meticulously clipping coupons, or are you better off forgoing this time-consuming habit? 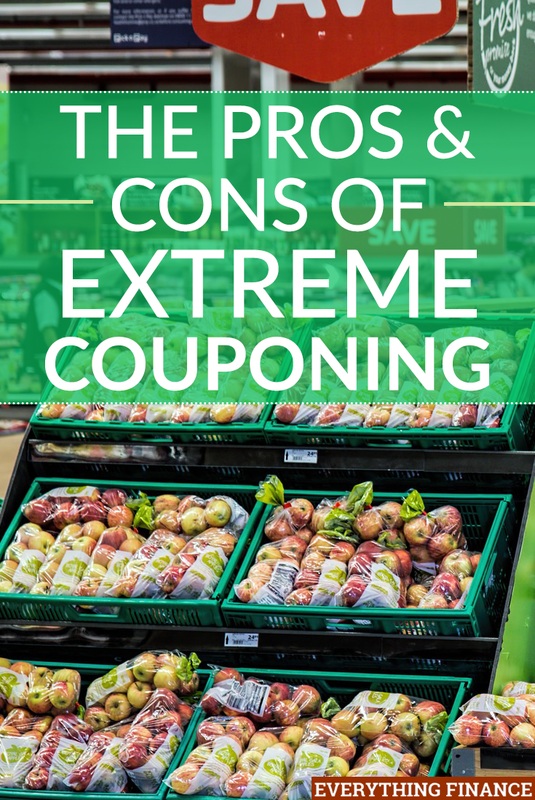 Here are some of the pros and cons of extreme couponing. Of course the biggest perk to extreme couponing is the savings you’ll get. By utilizing coupons, you may be able to buy items you regularly use for way less than normal. Furthermore, if you combine coupons strategically, you may surprise yourself by just how much you can whittle your grocery bill down. These savings can be beneficial if you have time to spare or are trying to keep costs down, or if you have a big family to feed and need to buy large amounts of some items. In most cases, the coupons you find and use are for purchases of multiples of various items and groceries. If you find that you buy a few key groceries often, it makes sense to stock up with coupons if you can. This, of course, is one of the major benefits of couponing; you’ll receive a great discount by buying your favorite items in bulk and you will always have a great stock on hand if you need it. Furthermore, if you happen to have a big family, couponing can benefit your budget greatly. With many mouths to feed, you’ll need to buy a larger supply of groceries. By strategically combining coupons and buying in bulk, you can feed your family for a much cheaper cost. Apart from just saving money, choosing to utilize coupons can make you a better shopper as well. Most consumers go to the grocery store and spend their time wandering from aisle to aisle. Even if you have a list, it’s easy to get off-track and end up with impulse purchases in your cart. More times than not, shoppers end up grabbing at least a random item or two that catches their eye, which means they also end up spending more than they thought. Coupons force you to be purposeful in your shopping. Since coupons only work on certain items and brands, you’re forced to grab only what you need or only what applies to your coupons in hand, saving you money and possibly speeding up your shopping process. Although clipping a coupon here and there doesn’t take much effort, if you’re truly committed to saving, you’re going to have to invest your time. Some of the extreme couponers spend more hours each week sifting through newspapers, ad sections, and online sites than they spend working at their job. Furthermore, if you’re really trying to save money, you’ll also have to spend time organizing and figuring out the best way to combine or utilize the coupons you find. If clipping coupons isn’t your sole job, you may want to ask yourself if it’s worth spending all your free time to save a few dollars at the grocery store. If it’s just you or you have an average-to-small sized family, you might find yourself wasting a lot of food. As I said earlier, extreme couponing usually equates to buying in bulk – think 20 bottles of ketchup. Not only do you not need 20 bottles of ketchup, but you probably won’t be able to use all of them before they expire. If this happens, even if you saved money on those items at the time you bought them, letting them go to waste means you ultimately waste that money as well. In the end, all that free time you spent finding those coupons was for nothing if it didn’t really save you money in the end. If you’ve ever looked through the coupon section of your newspaper, you may have noticed a pattern. Most of the grocery items on the coupon list aren’t exactly healthy. You’ll rarely, if ever, find a coupon for a produce item. Instead, you’ll find deals on processed items like chips and cookies. If your goal is to eat healthier, spending hours of your life clipping coupons isn’t for you. You’d be hard-pressed to find a coupon for lettuce or blueberries. Moreover, do you really want to tempt yourself or your family by having several 12-packs of soda in your cupboard? Extreme couponing is beneficial for some people, but for most people, it may not be worth the extra time and effort. At the end of the day, you can still find a coupon here and there to help you save money without going to extreme couponing measures. So it’s really up to you to weigh the pros and cons and decide what’s best for your family, and if extreme couponing will be a time waster or a big money saver. Have you tried extreme couponing? Have you found it beneficial, or have the cons outweighed the benefits for your family?